How is Convergence Affecting Government Technology Managers? 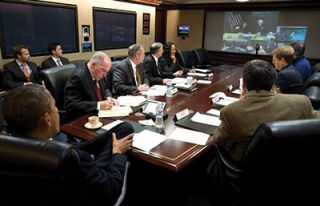 United States President Barack Obama is briefed on the response to Hurricane Sandy in the Situation Room of the White House. Photo by Pete Souza. The White House Situation Room actually exists—it’s in the West Wing—and the AV Operator-in- Chief is President Obama. That’s right: When video teleconferences (VTCs) are held between the President and his colleagues in the Situation Room, and senior government/military leaders in other locations, it is Barrack Obama who controls the AMX Modero Touch Panel. He decides whose microphones will activate and which sources will be called up on the twin HD monitors at the other end of the boardroom table. There are other monitors in the Situation Room, but the two at the end are the ones that matter. Granted, the remotely controlled cameras are likely being panned by support techs in the control room next door, but it is ultimately the President who gets to push the button— even in AV. “The White House Situation Room uses AMX technology to allow the many different users to control all systems in the room, including mics, cameras, monitors and the VTC suite,” said Troy Trujillo, AMX’s director of Air Force programs. “We obviously can’t reveal the specific details of what’s installed for security reasons, but we can confirm that this is a showcase for our technology.” Attentive AV watchers can spot what’s in the Situation room if they watch this video http://tinyurl.com/28767qx — a White House tour of the Situation Room. AV/IT convergence is good news for AV, because of the extra opportunities that VTC offers to AV professionals and vendors. At the same time, these opportunities come with two IT-related needs, which must be fulfilled to win and keep government business. Without interoperability, AV/IT customers can find themselves having to commit to one vendor’s VTC technology, regardless of price. Should VTC become seen as an essential government service, this could change: The public safety radios used by police, fire, and EMS agencies suffered from proprietary incompatibilities until the federal government mandated interoperable standards (Project 25) in 1989. Incompatibility between different vendors’ public safety radios was still an issue on September 11, 2001, which resulted in communications gaps between the NYPD and FDNY at Ground Zero. “We see interoperability as critical to leveling the playing field, increasing accessibility and lowering the cost of video communication technologies for state, local, and federal government agencies,” said Krish Ramakrishnan, CEO/co-founder of Blue Jeans Network. Inside the American Red Cross in San Diego — When disaster strikes, time is of the essence for first responders; decisions need to be made, and a plan needs to be implemented immediately. The AV systems at the new San Diego Chapter Disaster Operations Center (CDOC) include Crestron DigitalMedia and NEC displays. The organization’s officials say that the new technology helps improve response time and plan more effectively.Forecast: Ubiquity? Technological advances and the benefits of the Internet Protocol have helped merge AV and IT technologies. Combined with tight budgets, post- 9/11 security concerns, and the need for real-time communications, VTC has become emblematic of modern government communications. James Careless is an Ottawa-based writer who covers AV trends and broadcast applications for Streaming Media, AV Technology, and Digital Video.